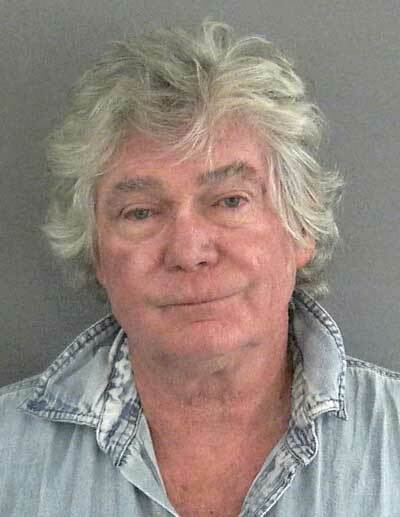 A 67-year-old Florida man was arrested after an unusual series of events in the Village of Sanibel on Friday evening. Patrick John McGowan had been drinking at Bonifay Country Club with a man he has known for about two years. The two men decided to get into McGowan’s golf cart and go to his home in the Megan Villas for a few more drinks. The man was on the veranda when McGowan came out with a handgun, threatening to kill him and accusing him of spying on him, according to an arrest report from the Sumter County Sheriff’s Office. The man convinced McGowan to put the handgun away. McGowan left the veranda, then returned and this time he was naked and carrying a marijuana pipe. He cajoled the other man and told him to smoke marijuana, and the other man, in fear of his life, pretended to smoke the marijuana. He said he was going to walk back to the country club to retrieve his vehicle. As he was walking, McGowan came up behind him in his golf cart and offered to drive him to the country club. But when the man got into the golf cart, McGowan started driving at a high rate of speed back to his residence. The man had considered jumping out of the golf cart, but it was travelling too fast. When they got back to McGowan’s garage, McGowan pulled a gun from his shorts and again threatened to kill the man. A struggle ensued and the other man took the gun and fired a shot to scare McGowan. When deputies arrived, the man was sitting on the floor of the garage with the gun and McGowan was laying on his side. McGowan was arrested on charges of aggravated assault with a deadly weapon, false imprisonment, battery, possession of marijuana and possession of drug equipment. He was booked at the Sumter County Detention Center and released on Saturday after posting $18,000 bond.